If...Then? 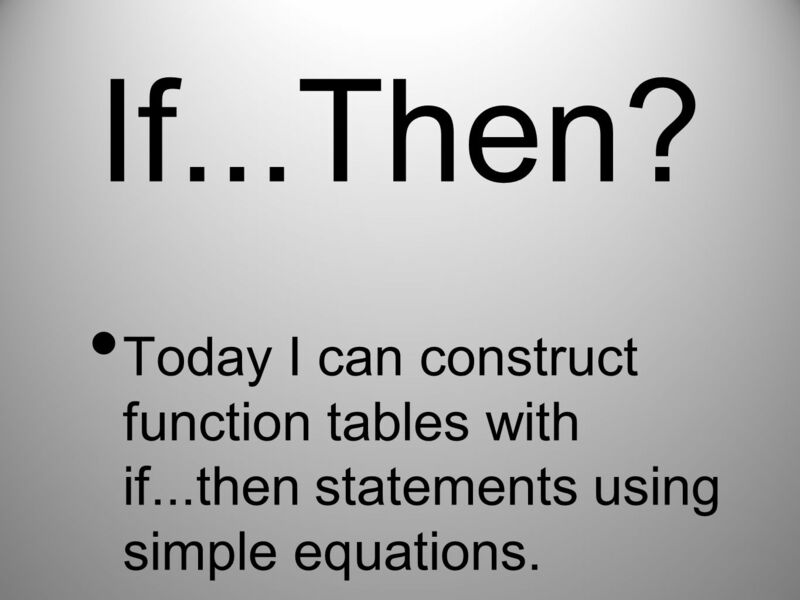 Today I can construct function tables with if...then statements using simple equations. 1 If...Then? 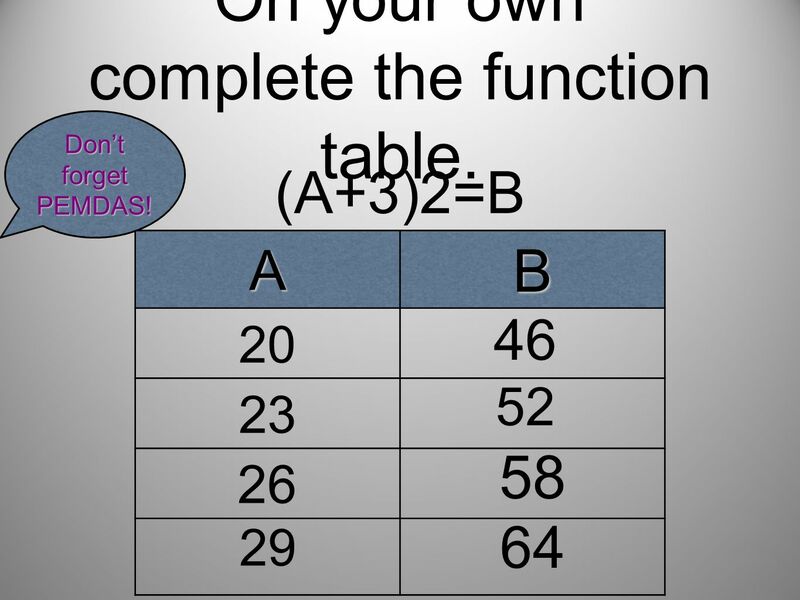 Today I can construct function tables with if...then statements using simple equations. 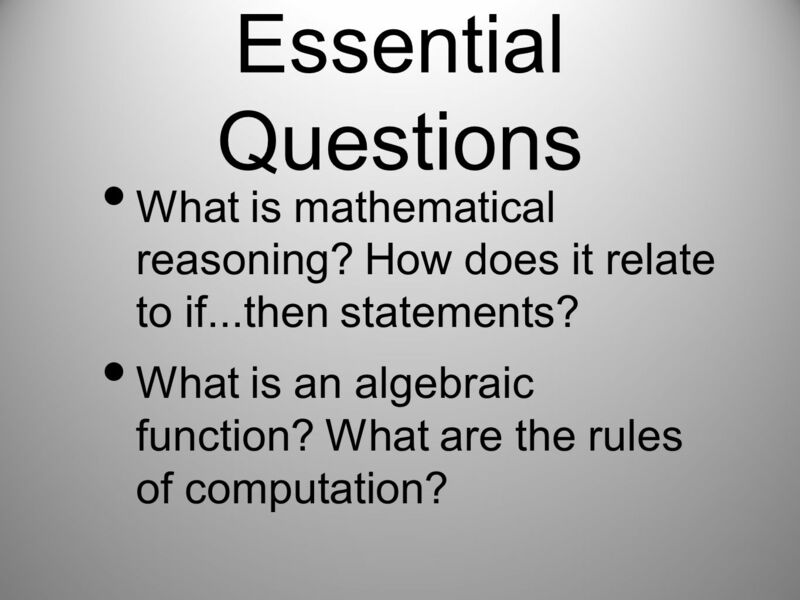 2 Essential Questions What is mathematical reasoning? How does it relate to if...then statements? 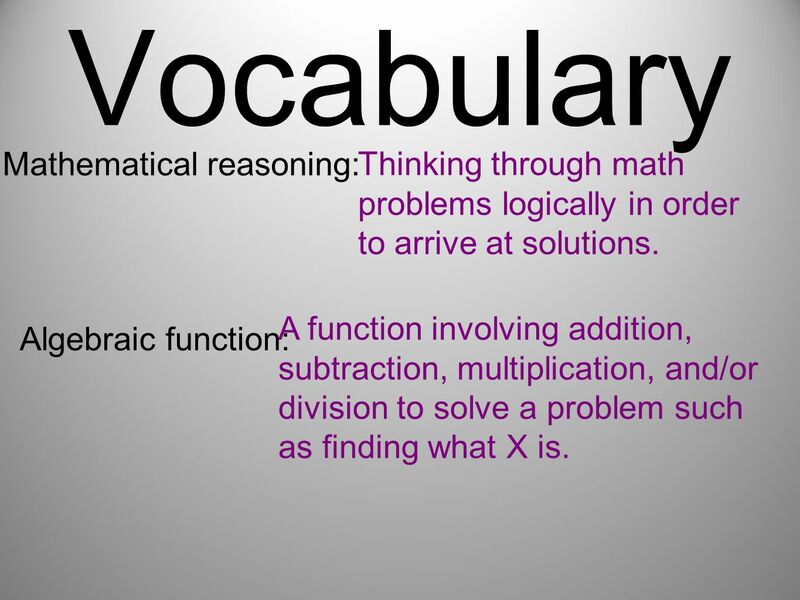 What is an algebraic function? What are the rules of computation? 3 For starters.... 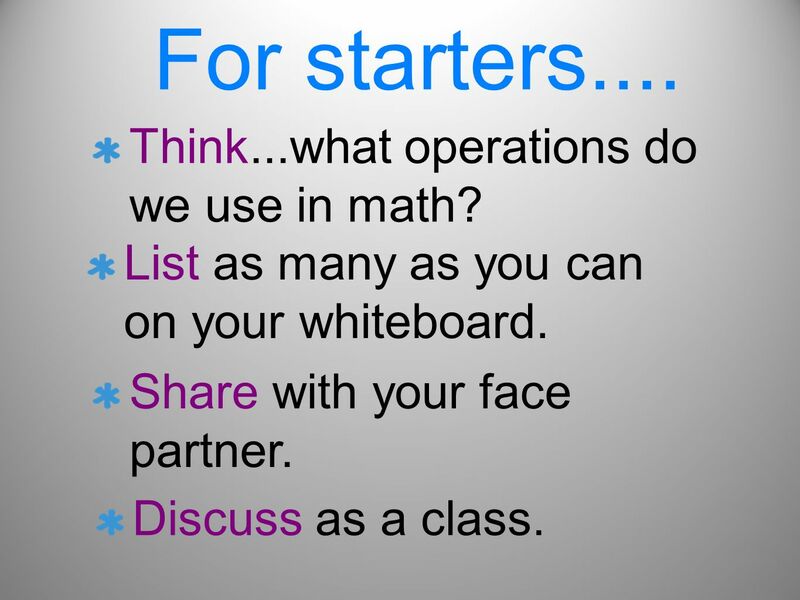 Think...what operations do we use in math? List as many as you can on your whiteboard. Share with your face partner. Discuss as a class. 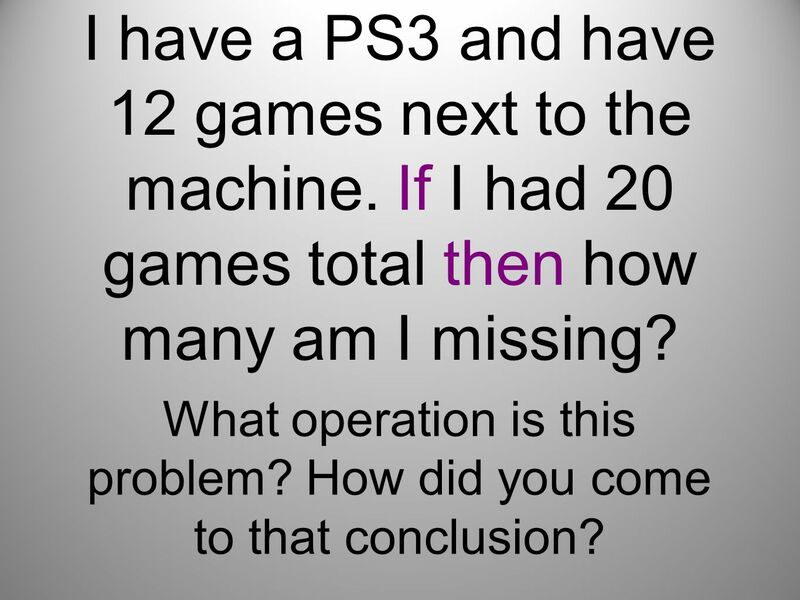 4 What operation is this problem? How did you come to that conclusion? I have a PS3 and have 12 games next to the machine. If I had 20 games total then how many am I missing? What operation is this problem? How did you come to that conclusion? 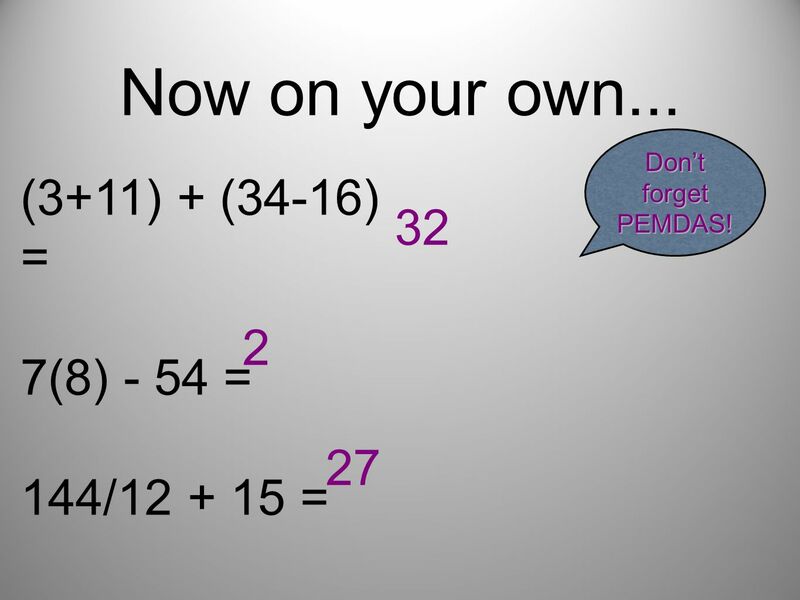 8 Let’s try a few using PEMDAS! 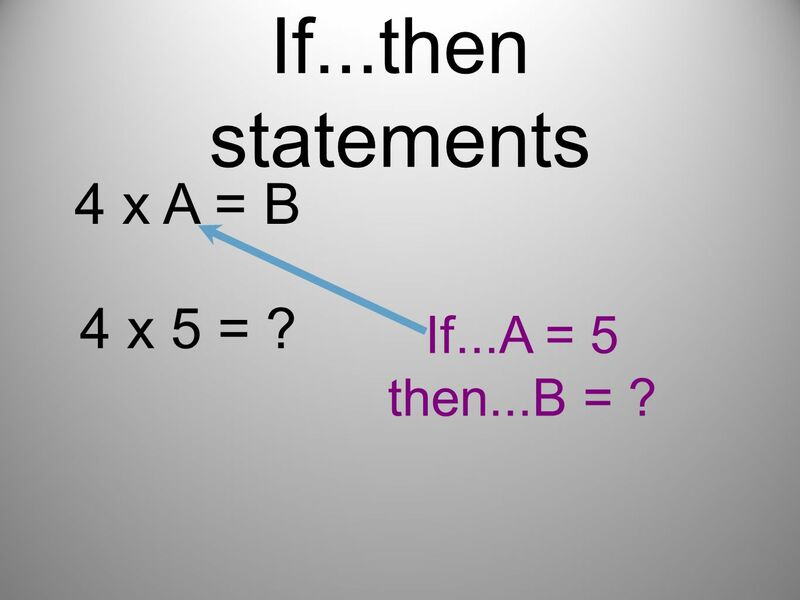 10 If...then statements 4 x A = B 4 x 5 = ? 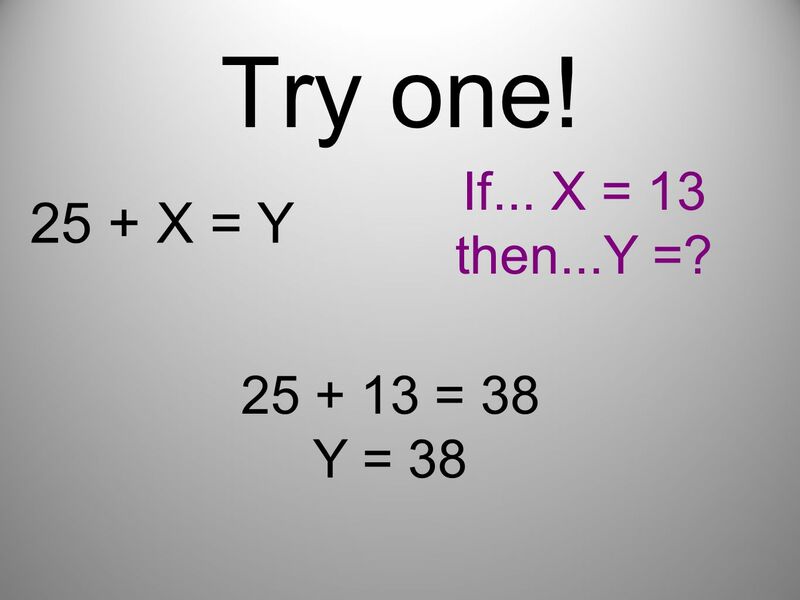 If...A = 5 then...B = ? 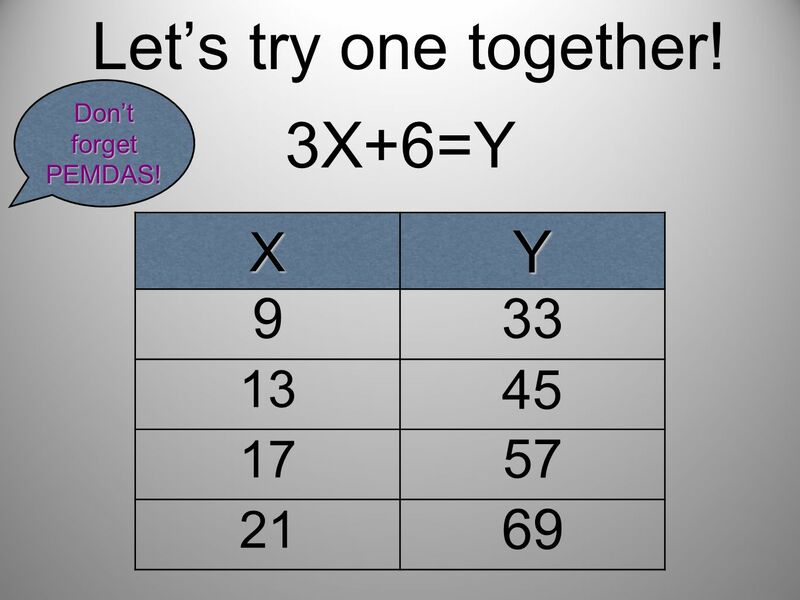 If I were to continue this table...using mathematical reasoning...what would come next? How did you come to that conclusion? 14 On your own complete the function table. How do if...then statements help me to complete a function table? 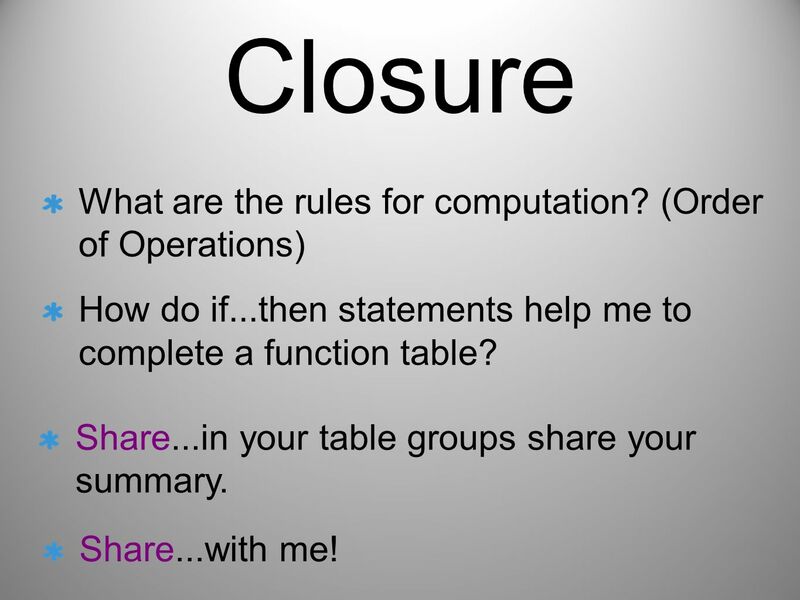 Share...in your table groups share your summary. Share...with me! Download ppt "If...Then? 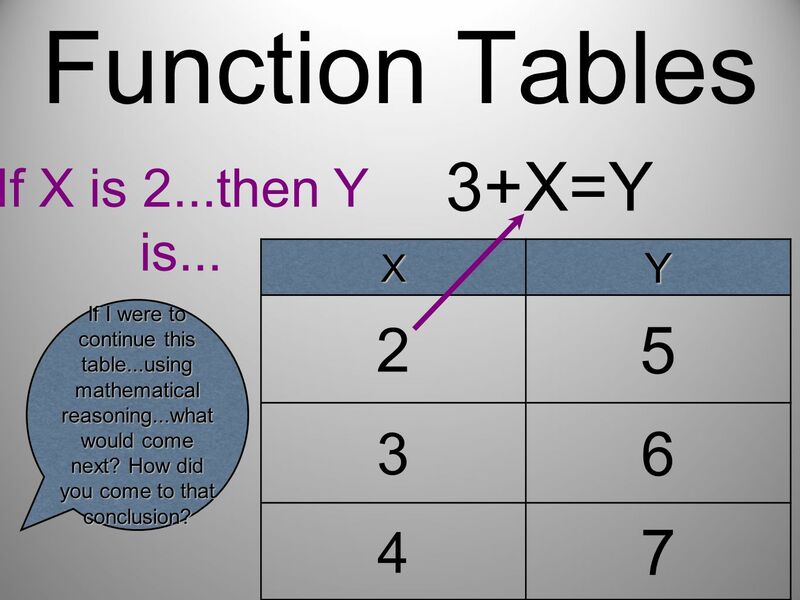 Today I can construct function tables with if...then statements using simple equations." Jeopardy ExponentsOrder of Operations Mult/Div Fractions Converting Fractions Q $100 Q $200 Q $300 Q $400 Q $500 Q $100 Q $200 Q $300 Q $400 Q $500 Final. 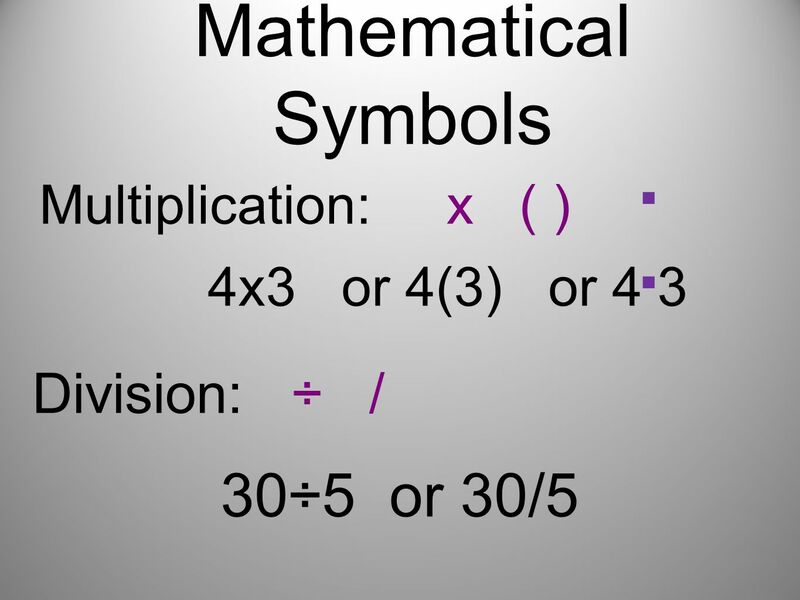 Order of Operations ( ) + X The Order of Operations tells us how to do a math problem with more than one operation, in the correct order.